Hard to believe S3 of Justified is over; feels like it only just began. To begin with, matching season 2's quality was going to be next to impossible. And the storyline about Mags' money's whereabouts recurred as a periodic reminder of how MAGnificent a character she truly was, worthy of that Emmy won by Margo Martinsdale. Her sole surviving son, Dickie, was periodically incarcerated and released this season, appearing frequently in his orange jumpsuit, not to mention his hacked-up haircut that made his head look like roadkill. And yet he's a survivor. Boyd and Ava emerged as the new "it couple" in Harlan, with reinforcement by cousin Johnny (whose bar also provided a HQ), the ill-fated Devil, and Arlo Givens, now losing his marbles. New villains included the deceptively cheery butcher, Limehouse, and Quarles, "the Husky," with his dapper suits hiding his awesome trick rail pistol, and sidekick Duffy, always a bewildered comic foil. Raylan is more alone than ever at the end of the season, after Winona walked out on him even while pregnant with their baby. Arlo has dementia, which has a mixed effect: he keeps envisioning Raylan's mother talking to him, and even though he kills Trooper Tom without remorse (even though there was a chance it was Raylan—"he was a lawman in a hat"), he seems somewhat relieved when he sees Raylan and realizes it wasn't him he killed. Small comfort for Raylan. In fact, Arlo treats Boyd more like a son than Raylan, and Boyd seems happy to keep Arlo in his posse. Ava keeps after Arlo about taking his meds. Arlo confesses to killing Devil, getting Boyd off the hook. Looks like Arlo will be doing some hard time. It's hard to imagine this father/son relationship will ever be resolved, but I love how family relationships aren't romanticized, so often the case on tv. Also, it's neat to see Ava finally growing a spine and taking on a leadership role, even if it is running a brothel and discovering for herself the power of a well-placed slap or kick (she already knew about bullets). Loretta turns up, now in possession of Mags' money. Now that Trooper Tom is gone, she is perhaps the one ally and friend Raylan has, oddly enough. At work, he's always been a bit of a pariah, garnering resentment from the other deputy marshals, as well as fatherly smugness from Art, even though they are all basically on his side. And there's the bar owner Lindsey, his landlord and sometime paramour. But that is too practical a relationship to be lasting. I've been reading show runner Graham Yost's weekly overviews, and it's amazing how the practical realities of the business affect the story lines. For example, Natalie Zea was hired for another show, so they can only get her for a few episodes. And that's why Kevin Rankin was killed off; he was hired for something else. So next time someone gets offed, think twice before you feel badly for them. Like some of the finest tv series in recent years, Justified captures a unique aspect of Americana that has great reserves of evil or misfortune lurking below the surface, such as The Wire, Breaking Bad, Deadwood, and even Arrested Development. If it hasn't already, it will join the pantheon of top shelf tv. 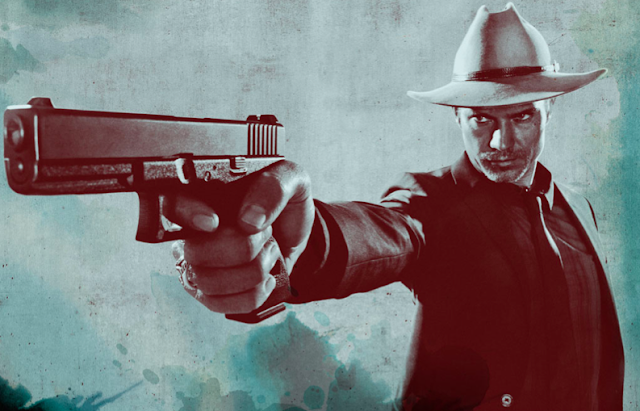 Will Raylan & Winona reconcile when the baby arrives? If not, what role will he play in the child's life? What will become of Arlo? Will Boyd & Ava continue their rule over Harlan's crime world? What about Johnny, since he somewhat betrayed them? And what will become of Loretta, since she's now the family scion of sorts?